A NASA investigation into the death of a space shuttle worker who fell from a launch pad at the agency's Florida spaceport last week has turned up no signs of foul play, or failures in safety equipment, a top shuttle official says. On March 14, James D. Vanover, 53, a swing arm engineer for NASA contractor United Space Alliance, died after falling from Launch Pad 39A at Kennedy Space Center in Cape Canaveral, Fla., where the space shuttle Endeavour stands ready to lift off on its final mission April 19. "It was a very tragic event early last week," NASA space shuttle program manager John Shannon said during a press conference yesterday (March 24). "The investigation is underway. NASA security, NASA safety and mission assurance, the inspector general, OSHA, the Brevard county sheriff's department and medical examiner have all been involved in the investigation." Shannon said there was no evidence of foul play, but NASA is still waiting for the results from the county medical examiner, which are expected in a couple of weeks. OSHA, the Occupational Safety and Health Administration, concluded that there were no problems with NASA's fall-protection safety measures. Vanover had worked at Kennedy Space Center for 28 years. 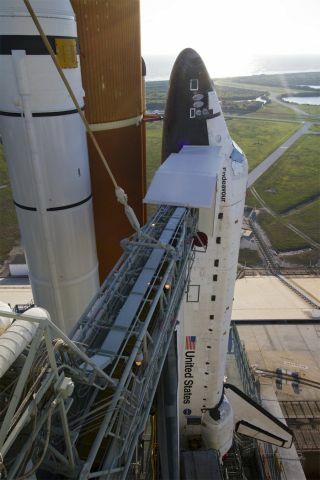 The incident was trying to an already strained space shuttle workforce that is facing heavy layoffs when the space shuttles retire this summer, Shannon said. "Obviously, it's a teammate that has died," he said. "We stood down for that day. There was a strong desire to resume work on Tuesday by the team. We kept the counselors out there for the entire week just in case anybody wanted to talk or any issues came up, and that I think was very effective." Overall, Shannon expressed respect for the dedication of the shuttle workers and their ability to maintain focus despite the many challenges they face. "They're just a unique team," Shannon said. "This is more than a job to them. They're extremely passionate about what they do. They're totally dedicated to supporting the legacy of the shuttle program and doing it right." The incident was not the first time that a shuttle worker has died on the job. "There have been four previous deaths from injuries at Launch Pad 39A," said space history expert Robert Pearlman, editor of collectSPACE.com. And another death also resulted from a launch pad fall. In May 1981, Anthony Hill, a construction worker, died after falling 110 feet from Launch Pad 39B (a twin to Pad 39A), at the Kennedy Space Center, Pearlman said.